PIN diodes are the workhorse of the solid-state microwave switch industry! 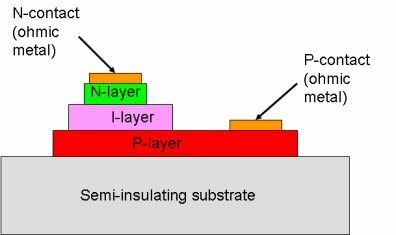 The acronym "PIN" corresponds to the semiconductor stack of P-type, intrinsic, and N-type material. PIN diodes can be made both on GaAs or silicon. A word of advice for anyone who wants to learn about PIN diodes... there are plenty of great data sheets on the world-wide web from PIN diode suppliers that explain everything! Why don't we offer links to them from this page, you ask... why don't they pay us for the business, we ask. The figure below shows a horizontal PIN diode, sometimes called H-PIN. 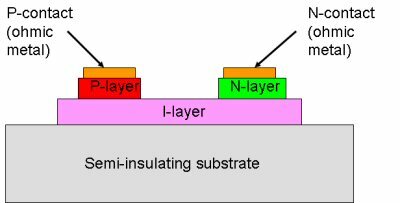 Here the P and N layers are formed on top of the I layer. Here's what is known as a vertical PIN diode or V-PIN. 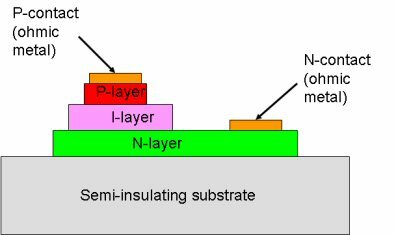 Here the diode is formed of a stack of the three materials, from top to bottom, P, I, N.
Last, here's a structure known as a NIP diode. It's just a PIN diode, upside down. A PIN diode acts like a current controlled resistor. The more current that you inject through the I region, the lower the RF resistance. The current/resistance characteristic is ideally R=K/I (where K is a constant), which looks like a straight line when graphed on log-log scales. Thanks for the correction, Morten! Look at the range of resistance that you can obtain, from 0.1 ohm to 10,000 ohms... yes, the PIN diode pretty much covers the entire horizontal axis of the Smith chart! (Look at the chart above, and notice that 50 ohms occurs very close to the center of the response). This is what makes it such a versatile device, it can behave like an open circuit, a short circuit, or any reflection coefficient in between. You can use it to create switches, phase shifters and variable attenuators, and we'll show you how if you follow the links at the top of the page. PIN diodes have a low frequency limitation due to carrier lifetime. What's a carrier? Who cares? The problem can be explained without worrying about semiconductor physics. A "normal" diode acts like a rectifier, no matter what the frequency. A rectifier has that familiar nonlinear I-V curve. While under forward bias, the current takes off for the moon after a half-volt or so. Under reverse bias, there is essentially zero current for many volts, until breakdown occurs. A Schottky diode is an excellent example of a rectifier diode, that's why it is used as a detector. RF enters, DC leaves. A PIN diode only acts like a rectifier at low frequencies. At microwave frequencies, the IV curve undergoes a change, so that it behaves like a resistor, whose resistance value is determined by the level of DC current that is present in the I-region. Thus a PIN diode is essentially a DC-controlled high-frequency resistor. 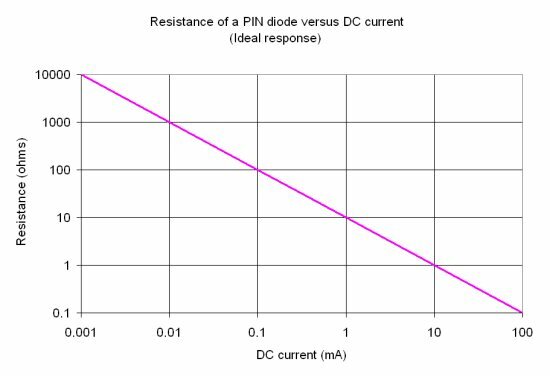 Just as important, if no DC current is present, the diode behaves like an open circuit. The frequency at which the PIN diode transitions from acting like a diode to acting like a resistor is a function of the thickness of the I-region. Thicker diodes can be used as switches to lower frequencies. By carefully selecting diodes, you can make a PIN diode switches operate down to 1 MHz. As if this behavior wasn't outstanding enough, wait, there's more! The DC control current can be small, while the microwave current can be huge... a few milliamps of current at DC can cause the PIN diode to short out an amp or more of RF current. This is a huge advantage to RF switch designers that need to consider power handling. PIN diodes can also be used to create limiters (a type of nonlinear device ), usually as one or more shunt elements across a transmission line. Often the diodes are spaced apart by the magic quarterwave to improve small signal response. A limiter is (usually) a passive device that has low loss for small signals, then increases its attenuation as power levels increase. Some PIN diode limiters are passive, meaning that the PIN diode creates the nonlinear response by itself. An "active limiter" adds a detector circuit that applies DC current to the PIN diode to turn it on harder, at lower power. The detector uses a Schottky diode. A switched limiter uses a DC control signal to turn on the PIN diode.